Whose Trillion is it Anyway? US Federal Government Shocker! With all due respect to CAFR and the fine work done by many individuals regarding how actual money is siphoned from the government to elitists, we are going to deal with the portion of government that operates in the hole and saddles the American people with continually increasing debt levels. Truth told, the American people are pretty good themselves at running up debt, but we’ll keep the piece aimed at federal policy. Prior to August 15, 1971, the US Federal government settled external debts in gold. The way the system worked was fairly simple. If a country ran a trade surplus, it was owed gold. If it ran a deficit, it owed gold. This system essentially proves the claim that there are two governments in America. Think about it – if the US ran a trade deficit, some part of that deficit was due to American companies and consumers using more imported goods than what went out to foreign countries. The US Federal Government settled the entire imbalance, even the portion it wasn’t responsible for. Before we start slapping Uncle Sam on the back, realize that in the better times the US exported more than it imported, resulting in a trade surplus for which Uncle Sam was compensated in gold. That system, known as Bretton Woods, ceased to exist when the US accumulated so many trade deficits that it came perilously close to running out of gold. 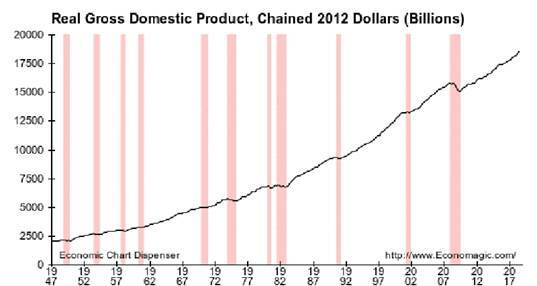 The system was abandoned in 1971 and the Petrodollar came into existence fairly soon thereafter. If you haven’t do so already, please read our article on the Petrodollar. This will all make more sense when you’ve done so. Since 1971, the US has run many, many months and years of trade deficits and many, many more months of budget deficits. The two are added together and called the ‘current account’. The USTreasury issues bonds (debt) to get the cash to balance the current account and this is what began the accumulation of what we call the national debt. Not including Richard Nixon, who was the President in 1971 when the gold standard ended, we have had 8 Presidents since. The first trillion in national debt was accumulated during Reagan’s second term. Since then, we’ve added 20.5 additional trillion – and that is only if you use government accounting methods. Using GAAP, the amount is roughly ten times more. Getting back to the first paragraph, it is completely incorrect to assign credit or blame to one person for the accumulation of any of this debt. Granted, Presidents have a huge platform to speak and have ideas heard, but outside the arena of the Executive Order, it is Congress who sets economic policy, along with the nearly unaccountable not-so-USFed. It would be much more accurate to point out that NONE of them have gotten up and dedicated their time in office to balancing the budget, although Reagan did make it very clear that he felt fiscal irresponsibility was reprehensible. The 1980s saw the peak of America’s attention to the fiscal behavior of its government. Most of our leaders have ignored the entire concept of the national debt except when it is convenient. Consequently, the American people don’t pay the whole idea a lot of attention either. Let’s take a moment and look at this from another angle though, because some very important realities are being lost in the shuffle. 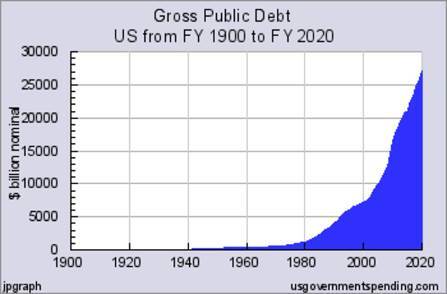 To say that the USGovt has racked up a trillion dollars’ worth of debt in 12 months doesn’t tell the whole story. We need to look at what happens to that borrowed money. It is spent. Therefore, it ends up in GDP. Now, let’s remove a trillion dollars from GDP over the past twelve months and what happens? Let’s also add the debt that consumers accumulate and spend into the economy and remove that from GDP as well. It begs the immediate question: Can the economy be booming if the fuel for the boom was borrowed? A corollary to this would be: Shouldn’t all this borrowed money be removed from the GDP calculations? There are many who say it shouldn’t because it is still spending and it still creates jobs and economic growth. There are others who say it should because the money (plus interest) is owed back to those from whom it is borrowed. They further argue that while it does result in growth and jobs, that somewhere the money will need to be repaid, therefore the economy will suffer as America endures its own austerity to come up with the savings to pay pack this debt. Notice we are not answering any of these questions, we’re leaving them to you to answer. In the interests of fairness, one could argue that there should be two measurements of GDP; one that reflects how our economy is performing without the debt-fuel and how it is performing with the debt fuel. Obviously, the measurement that includes debt is going to be far more appealing while the measurement that doesn’t will be more instructive. Right now, America has, by and large, the benefit of the majority of its creditors rolling their bonds over into new issues and being satisfied with the interest. Above and beyond this, they continue to purchase even more USTreasury bonds, which creates a dangerous illusion – that there is no day of reckoning- that the ‘credit boom’ will last forever. There are many economists who have seen their reputations and credibility shattered by pronouncing prior booms to be perpetual. Here are some examples of what Alan Greenspan liked to call ‘irrational exuberance’ in the 1920’s; when America was at the height of its smallest boom to date – yes, the smallest. The outrageous alleged statement of Keynes aside, we are seeing some very prominent names in the list above. The same is said today of the idea that America can go on forever on its current trajectory of debt accumulation; that the bill will never come due. There are some very prominent economists and political scientists who have had their reputations shattered because they predicted the current circumstances would end immediately upon their prediction only to see the circumstances not only continue, but become even more ludicrous as well. At the end of the day, we are unfortunately left with more questions than answers. Whose trillion is it, anyway? We hope you come away from this understanding that the national debt doesn’t belong to a political figure. In truth, it belongs to all of us even though the vast majority of us had zero say in implementing the policies that have brought about this miscarriage of finances. Should economic growth that arises from the accumulation of debt be considered economic growth? Or should it be published with an asterisk next to it indicating there’s more to the story? There is a recurring theme here though, and a disturbing one. We find so often that discussions on policy revolve around who has done what, who will do what, and who is just talking about it. As is often the case, sometimes it is better to ask the opposite: Who isn’t doing anything about it and has no plans to do so? That question, unfortunately, has an extremely long list of answers. As far as where we stand – we know we’ll get plenty of colorful email regarding this – the reckoning day is already taking place and has been for quite some time now. America is having to rely on its military like never before in an attempt to enforce the economic policy we’ve outline above. American families are saving nothing and, in the process, borrowing themselves into oblivion. More Americans are on anti-depressant drugs than ever before and there are several studies out there linking this reality with financial distress. Marriages are being hit especially hard with ‘money problems’ being the most often cited reason for divorce. Yes, the bill is coming due, but we fear that we won’t just be paying it in monetary terms, but possibly with our way of life as well.